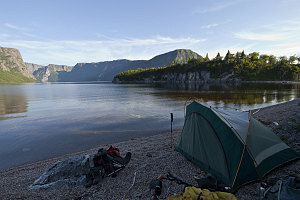 After the interesting geology session at Green Point, we continue a few more minutes north up highway 430 to the Western Brook Pond trailhead, where we would start another overnight backpack. This route was a 'there-and-back': we would hike in to a backcountry campsite at Snug Harbour, then hike out the next morning by retracing our steps. 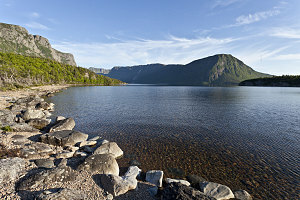 Western Brook Pond is one of Gros Morne's most beautiful and probably its most widely-known bit of scenery. The pond itself is really a fairly large lake - a long, narrow trough deeply cut into the Long Range Mountains. It is in fact a huge glacial fjord - but not one that actually makes it all the way to the ocean. 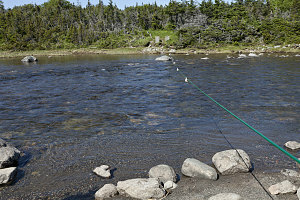 Instead, a wide brook drains the waters of Western Brook Pond through a section of low-lying coastal bogs and marshes to the Gulf of Saint Lawrence. 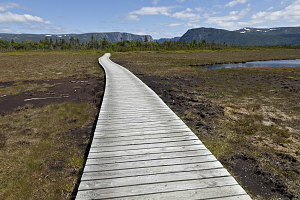 The first part of the backpack follows the Western Brook Pond trail, and it is as easy and flat as you could imagine. It is extremely developed, and, on a nice sunny afternoon like this one, was extremely busy with people of all ages and abilities. 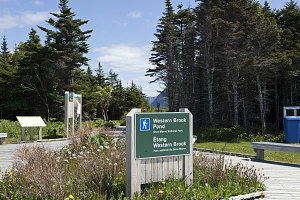 The Western Brook Pond's trail is primarily used by people who are taking the very popular Western Brook Pond boat tour, a signature activity of the park. 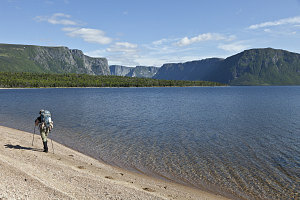 To take the tour, people are obliged to walk the 2.5km distance from the trailhead to a dock on the shores of Western Brook Pond itself. We headed briskly eastward on the wide, often boardwalked trail, through short patches of forest and across large expanses of marsh and bog. In the distance, we could see the edge of the Long Range Mountains, and the deep gash that Western Brook Pond's fjord made in them. Not long before the boat dock is reached, we veered left on a much smaller trail. 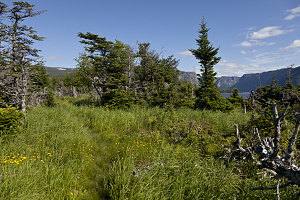 This trail led around the northern edge of Western Brook Pond towards the backcountry campsite. The major obstacle of the journey was just a few minutes ahead: the crossing of Western 'Brook' (at about 100 feet wide, more of a river than a little brook). The park service used to have a bridge here, but apparently it kept getting washed out, and now there is a long green cable that can be used as a hand rail. We had heard all sorts of stories about this crossing, and were apprehensive that the river conditions might make it too harzardous to cross. As it turned out, the river was in a relatively placid state. The water did get crotch-deep in one spot in the middle, but the current was relatively mild and the security of the hand-line made it no problem at all. Chilly, though. Once beyond the ford, the trail became far, far fainter. In places, the tread was covered in grass. It was quite a beautiful walk, though, through some pretty sections of forest and along sections of Western Brook Pond's lakeshore. Only in a few places did stretches of trail muck interrupt the scenery. Finally, after about 8km of almost entirely-flat hiking (and a few false turns -- this trail is not always well-marked), we arrived at the backcountry campsite at Snug Harbour. Snug Harbour is a tiny little cove tucked away on the northern side of Western Brook Pond, just before the point at which the huge and beautiful fjord section starts. As a result, one gets an excellent view up into the mouth of it [the fjord] from there. Parks Canada employee Trevor had said that there we were the only people who had a permit for Snug Harbour this night, but as we arrived, it was clear we weren't alone. A group of two or three guys had set up camp in the only backcountry site, and we felt in the mood for solitude. So, we decided to trudge a bit further down the pebbly beach of the harbour, and chose a spot where we could flatten out the sloping pebbles along the beach into a crude tent platform. It was perhaps better than the backcountry site, in a way -- we had a direct and beautiful view across the water towards the majestic fjord. 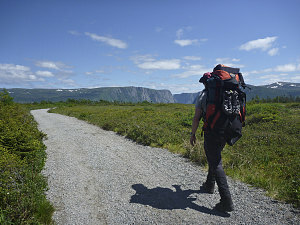 We had some thoughts of doing a short climb the next morning to the edge of the high plateau above us, in order to take in what was likely a stunning view across the land and down into the fjord. We were unsure of how long that would take, whether the way up would be a bushwhack or not, and whether the weather would hold. We decided to do a little advance reconnoitering, and walked further along the shore of Snug Harbour to see if we could locate the beginning of the ascent up to the rim, which looked as if it should start from the water's edge. As it turned out, the start of the ascent path is marked with a park sign, and the first few metres at least seemed to be a decent trail. We returned to our lakeside campsite and retired for the night.